SystemZone is ideal for simplifying many complex installations. Here SystemZones are used to collect water from multiple boilers and to distribute it to multiple heating zones. Installation of a boiler array is less expensive than one or two large units with tall chimneys. Multiple Systemzones and the SystemLex Wiring Centres can be cascaded together very simply to create an installation as large as you wish to. ​Here is a smaller boiler array suitable for a large dwelling or small commercial premises. 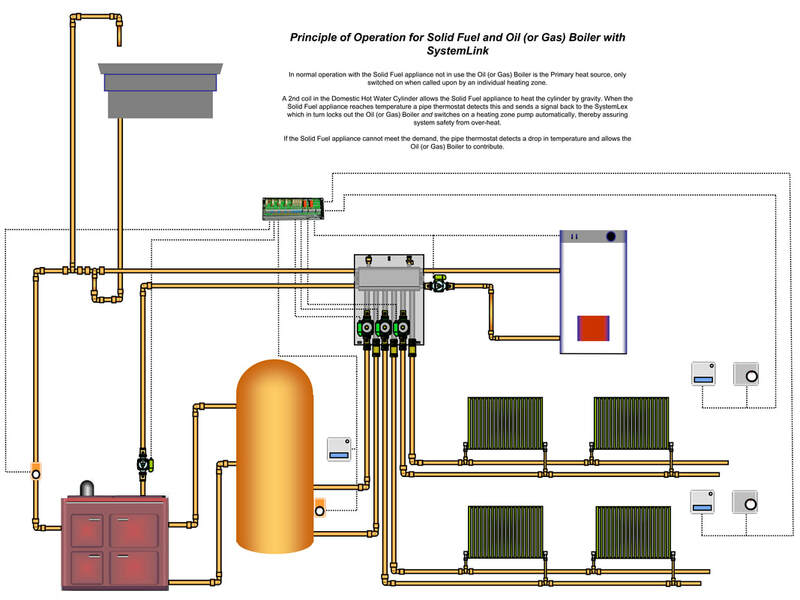 The boilers in use in an array will work most of the time at their optimum load and therefore will be most efficient. Boilers also act as back-up for each other, allowing for maintenance and repair while keeping the system running as normal. Integrating renewable energy sourcesSystemZone is excellent for complex systems with a variety of heat sources and different heat emitters. 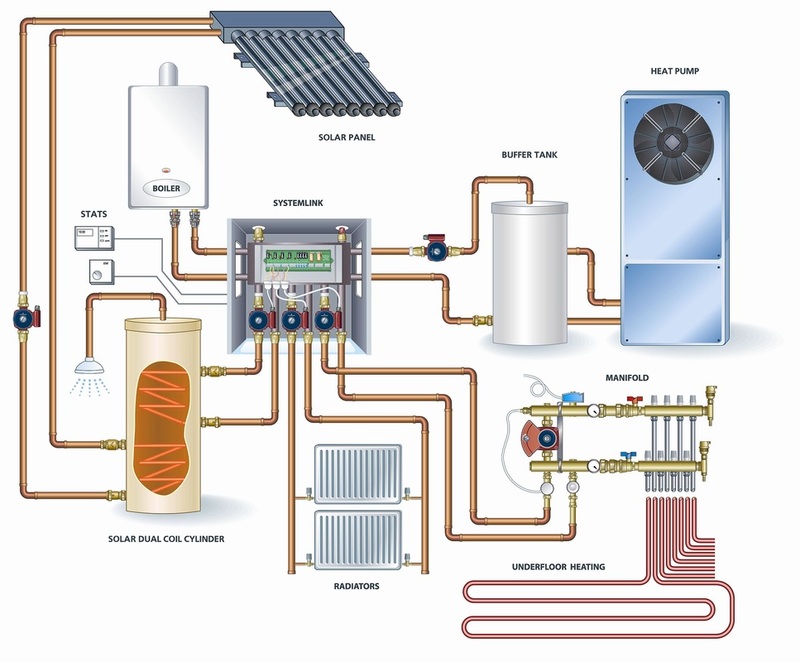 Here is a typical installation with an air-to-water heat pump, a back-up boiler (gas or oil), solar powered hot water with underfloor heating and radiators. The illustration shows the SystemZone incorporated in the SystemLink Zoning Centre. 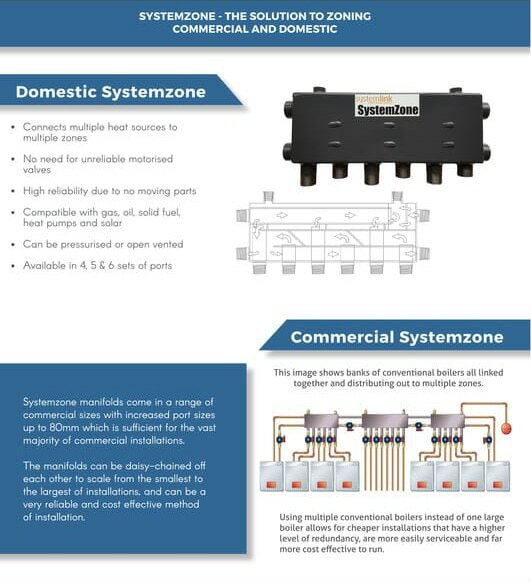 Solid fuel combinationsSystemZone is ideal for systems where different heat emmitters are combined, such as solid fuel and oil or gas. For more information on how to use SystemZone or any other Systemlink Product, see our Technical Downloads page. SystemZone's unique patented design ensures that each boiler and heating zone operates independently of all others. When the pump in a particular zone or boiler circuit is inactive, no water moves in that circuit. This is achieved without motorised valves and with all waterways open at all times. No other method achieves this result. Safety is guaranteed as no waterway is ever blocked by a valve. No separate bypass is required. SystemZone automatically creates a neutral point within the unit. The neutral point can be difficult to locate in conventional plumbing layouts. 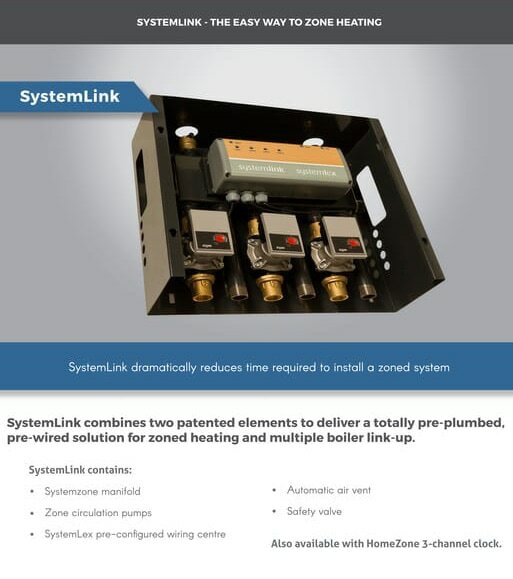 With SystemZone, fewer parts, simpler design and easier fitting significantly reduces installation costs. A further advantage of the independence of each circuit is that different flow rates can be specified without creating any conflicts provided that the primary pump is sized to cater for the total flow rate leaving the manifold. This makes it easy to create mixed systemswith a variety of heat sources and heat emitters. The water entering the SystemZone slows down because the units cross-sectional area is many times greater than that of the pipes feeding it. This allows any trapped air to accumulate at the top of the unit where it is continually extracted by an automatic air vent. The pumps in the system therefore work with maximum silence and efficiency, air locks are minimised and radiators are much less prone to need bleeding. 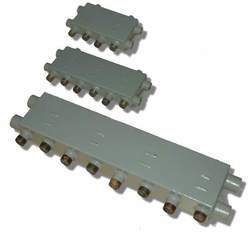 As SystemZone has no moving parts, reliability is guaranteed.